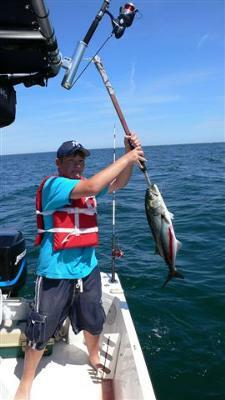 On this day I was using a bait rig for catching the mackerel. And all of a sudden I hear "zzzzzz", and my reel starts whipping out line. And so I set the hook not knowing what was at the end of the line. It took like 13 minutes to get the fish up, and I actually caught this blue fish. It was the strangest thing ever. The hook was like a kibby sized hook and it didn't break! But is was really bent. And here's the striper page.